Hello all, it’s been almost a year since I have posted on here. 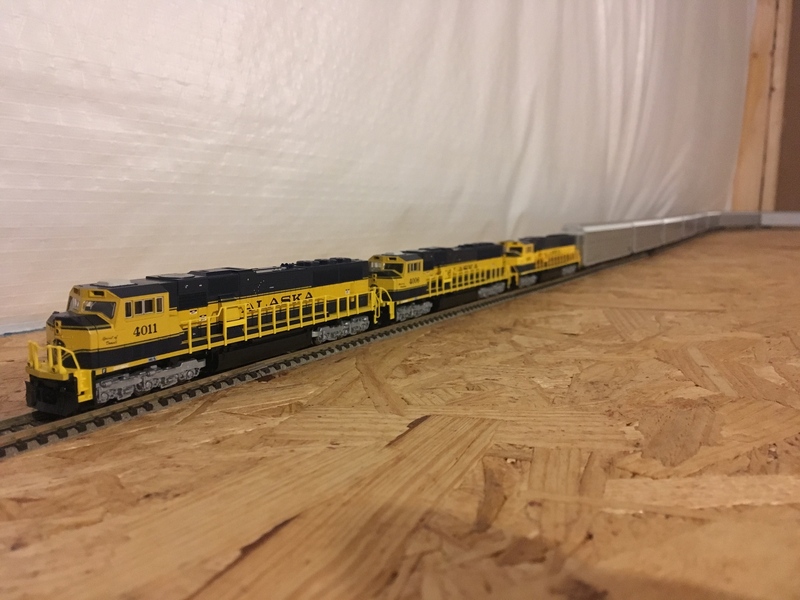 In that time I have torn down and sold my HO collection that was in my 15x8 mechanical room and started buying n scale Alaska trains for my new 19x14 train room in a house we had built. I wanted to run by an initial layout sketch I made up today to see if you all think I can accomplish what I think I may be able to accomplish in this space. here is my initial attempt, looking mainly on shape of benchwork and if the elements can fit And if there is another benchwork design you think would work better in the space. I like that. There are many opportunities to break off the main to a siding or spur to service industries or interchanges. I think you'll enjoy this, provided you make it interesting and all the points don't face the same way to diverging industrial tracks. Looks like eficient use of space to me. , like the single alley instead of a maze passages between the benches. Track plan wise , the vertical line on the right wall, to me it looks like "emergency" behind the scenes shortcut to the yard. Perhaps alreasy in progress but Seward should probably be more of a "endpoint" destination with return loop hidden . I like it. The only suggestion I would make is that if the layout height is high enough that you could do without the dividers on the peninsulas and have tall mountains there instead as a view block. Nice layout with a lot of options. Why not have a point-to-point setup can convey that the train moves beyond the layout? You might consider that instead of two circles at the ends. Just a thought. Concept looks very workable. Your drawing appears to have some curves that are tighter than your 20" minimum. A free hand drawing can be a trap and sucker you into track arangements that you will not like. Suggest you get one of the free track laying programs and verify everything fits like you expect. That includes some edge margin for tracks close to walkway. An alternate approach is one I used many years ago. I covered the floor with cardboard then drew out my track on it to verify everything fits OK. Also lets you draw in some of the industry and make sure they fit OK.
That is definitely not a freehand drawing, that's from a graphics or CAD program of some sort. I was looking, I don;t see anything that comes in under 20" radius - the tightest loops seem to be the ones at the ends, and I count 7-9 squares which appear to be 6" each, so 42"-54" diameter, 21" radius or better. This is indeed a track planning program, I am using anyrail currently put only have the trial version as i havent needed to plan this big of a layout before. 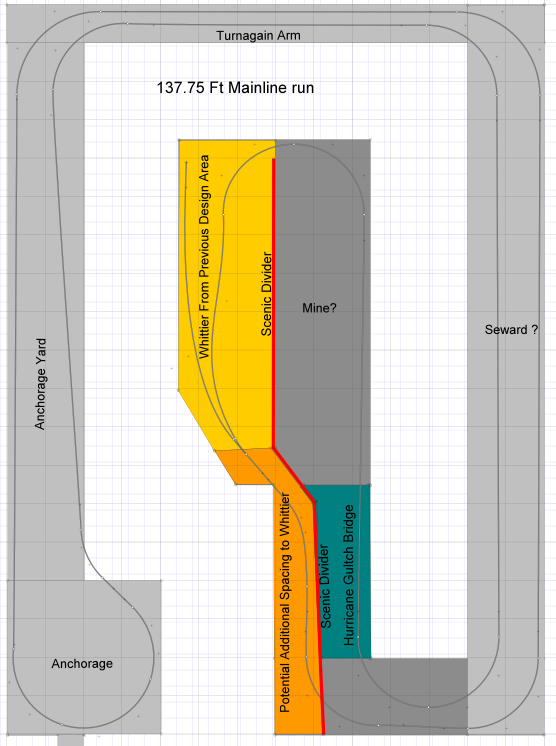 I think you all have brought up a good point and this layout would benefit most in layout from a point to point setup. The curves take up a lot of room on the dogbones. I will work up some ideas for a point to point tonight. I have some good ideas and hopefully i can get them on here. PED i like your idea of drawing on the floor, currently i have painters tape laid out on the floor. I will probably draw it all out on the floor because i plan to paint the concrete floor as i finish the room. This room is the one unfinished room in the basement so i need to still frame, install lighting, drywall and put in a drop ceiling. Working on the layout design right now is strictly to lay out the benchwork so i know where i will need to install lighting. The yard is not currently functional but just there as a placeholder for amount of track on how it will look. I need to figure out how to make it funcitonal in about 5 ft.
Should be able to have the harbor area sceniced and buildings on the other side of whittier st. I will have to make sure i can access the wye tracks from underneath. I had to make some adjustments to the first benchwork design. 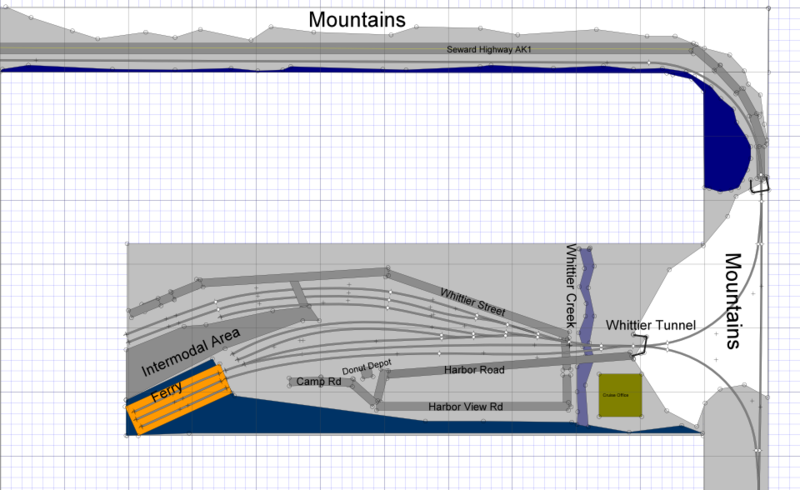 I increased the length of the peninsula to 9' from 8.5' to fit more intermodal. The aisle by the yard will only be 2' now. Not too bad as i plan to operate solo. Although this peninsula only ended up being 3' wide down from 3'6" so i will be able to add some space between the peninsulas. I would appreciate any thoughts on this arrangement and how it may be improved. A long spiral peninsula "G" with only two turnback curves ("blobs") is often an optimal approach. A point-to-point schematic can usually be overlaid on this with a hidden or visually de-emphasized continuous-run still an option. Good luck with your layout. the track traces a path near the edge of the benchwork around both pennisulas. or ... having the track from the upper right corner crossing across the upper pennisula to the lower pennisula, returning to the upper pennisula before reaching Seward. avoiding the curve from the lower half of the lower pennisula, instead coming from the upper half of the pennisula, Steward could also become more of an endpoint with lengths of straight track, extending from the lower loopback to the upper half of the lower pennisula. And everyone else for that matter. Thanks for the feedback so far it has been very helpful to try to think through this. I put the long spiral G penisula down on any rail and i think its going to work well. I am just trying to figure out how to overlay a pt to pt where it makes sense for a progression on anchorage-Scenic Stretch - Whittier-Scenic Stetch-Seward. One thing i really love about this is i can place the hurricane gultch bridge on the peninsula and get the space for a long 3' bridge and not have to make it double track to complete both sides of the loop like the exterior walls. The single spiral peninsula should give you more flexibility in choosing scenes, good approach. Note that benchwork edges can curve in and out, allowing narrower benchwork between major elements and reducing the amount of layout to eventually scenic. And the sides of the backdrop on the peninsula can likewise curve, allowing you to emphasize major scenes and reduce the depth of the scene elsewhere. Modulating benchwork and scene depth is a good way to open aisles, focus attention, and free up your resources (money and time) for the more important elements. I have not been working on the design or finishing the room as much as i would like. But i have determined that the spiral penisula and the G shape is the right one for me. I have built one quick table to see what a 2' space looks like that will be the main around the walls width where needed. Here is a look at most of my n scale equipment that i had to take out and see how it looks. I love the decision to switch from HO to N seeing this all on a 8' section. One Question to everyone. I am trying to figure out where to place lighting over the spiral G. I am thinking about using these lights from the home depot. The room is so dark currently it will drive me crazy even framing walls and hanging sheetrock i am thinking i will put the lights up first. I am thinking I should be potentially ok with a light centered over the peninsula, and then one in each corner of the room. Does anyone have a good rule of thumb on how much light is needed per sqft for a layout? I have about $300 to spend on lights and will install them myself. Or does anyone have better lights that they have used? 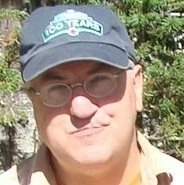 One point on names: It is my belief that the Alaska Railroad runs from Seward at tide water (harbour) to Freeport and then on to an Airforce base. 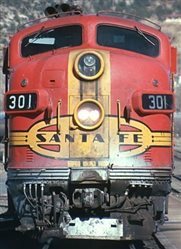 Unit tanker trains? 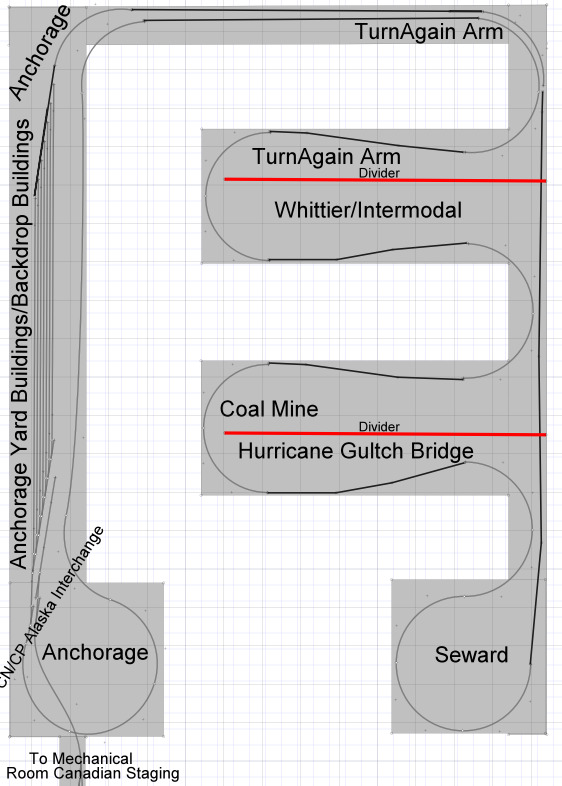 Anchorage is the Alaska pipe line terminal. The railroad runs thru Denali National Park. Wild life and tourists? It is your railroad, it runs where you want it to, to cities that you name. 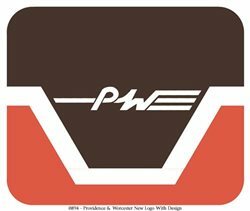 Hello Kyle, a fellow N scale Alaska modeler here! amazing amount of information, and the website owner can get you in direct contact with former engineers, conductors of the ARR! I would also suggest the one and only MRR published track plan of the ARR from the June 1996 issue. "Modeling Today's Alaska RR" in N scale. the plan would fit your space (with a few minor modifications) and is very true to the prototype. I'm biased to the plan, but it is one of the best track plans in MRR operations wise being true to the prototype. I am building a modualr version of it. Also if you want to get your feet wet in some Alaska modeling, MR's new layout "Canadian Canyons" would be a perfect fit for the ARR. 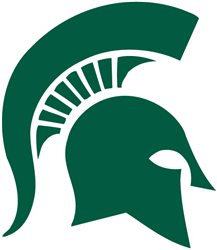 Good luck, and I'll be following along! My ARR build thread will be going up around the holidays! Does anyone have a good rule of thumb on how much light is needed per sqft for a layout? A reasonable level of lighting for model building is about 100 footcandles (FC). One lumen produces 1 FC per square foot. So to light your room to 100 FC, you'd need 26,600 lumens. Unfortunately, the best light level for model building is not necessarily best for model viewing, so you'll need dimable LED's or another set of lights for operating the layout. Also, you'll probably find 5,000k to be better at simulating daylight than the 4,000k fixture you linked to. I'd look for 30,000 lumens of dimable 5,000k fixtures. Nice to see another N scale Alaska modeler. 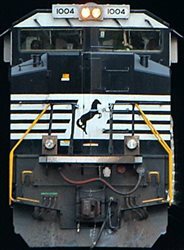 I just switched to N from HO when i saw Kato was going to run more SD70MACs with alaska paint. I have visited John's site and it was very helpful for working up the quick plan of whittier and thinking about the rest of the layout. Especially the yard plans! Thanks for passing along the track plan and date from MRR, i was not aware of anyone desinging one for Alaska in N. It really is quite impressive to fit all of those locations in, even in N scale. I also am exicted to see the canadian canyons layout come to fruition, it will be great inspiration. I think i am going to definitly draw ideas from both layouts as i work on mine. I still have a long time to plan before the room is finished, and i want to narrow my scope so i can have a longer yard in anchorage. I think at this point i will only include Usibelli, Anchorage, an interchange with CN/CP and Whittier. I will include some of the seward type operations to whittier as a result of the fictional "Canadian Link" economic boom. I am really looking forward to your build thread! Carl - Thanks for the info on the lights, i will have to start investigating some new lights. Definitely dont want to limit myself on this layout that will be my layout space for the next 10 years or so. Light placement is an interesting topic. My current layout (under construction) has lighting above the layout in shadow box form. I worked very hard to get everything like I wanted, including a backdrop low enough to allow drop ceiling acrylic lenses to rest on top of it. I have now discovered the flaw in my plan, namely that rolling stock near the edges of the layout is not very well lit. The tops of cars are quite bright, but the sides are shadowed. In hind sight, I think I would have preferred to have my lighting in the aisles as I had with my previous layout so I could read car numbers more easily. Spillover from lights across the aisle helps, but it isn't perfect. Things aren't so bad that I am willing to start over, but if you haven't done anything for lighting yet, put the lights in the aisles. As for how much light, my personal opinion is that you can't have too much light and this becomes more true as you age.